This is not a church that I had ever managed to get inside until a few months back, despite the evident will of the parish to let me do so. 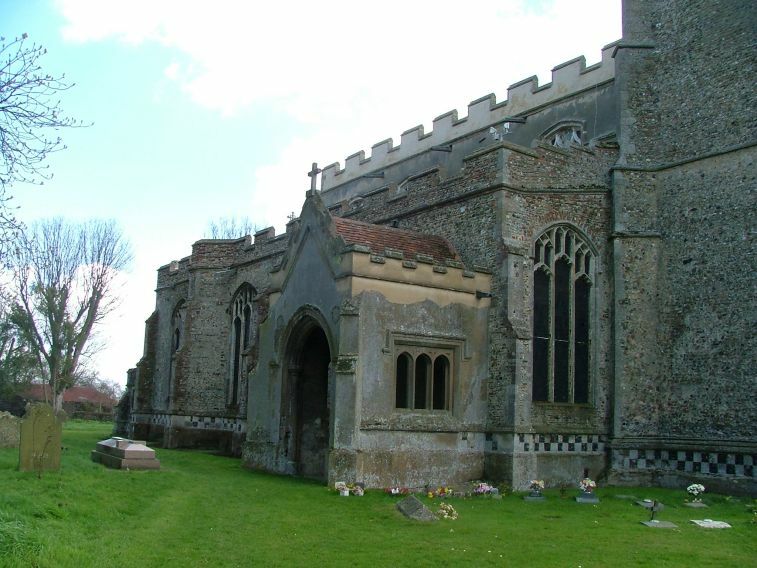 St Lawrence stands distant from the busy main road in the heart of the old village, and is surrounded by huge houses. The road curves around it in an ancient way. 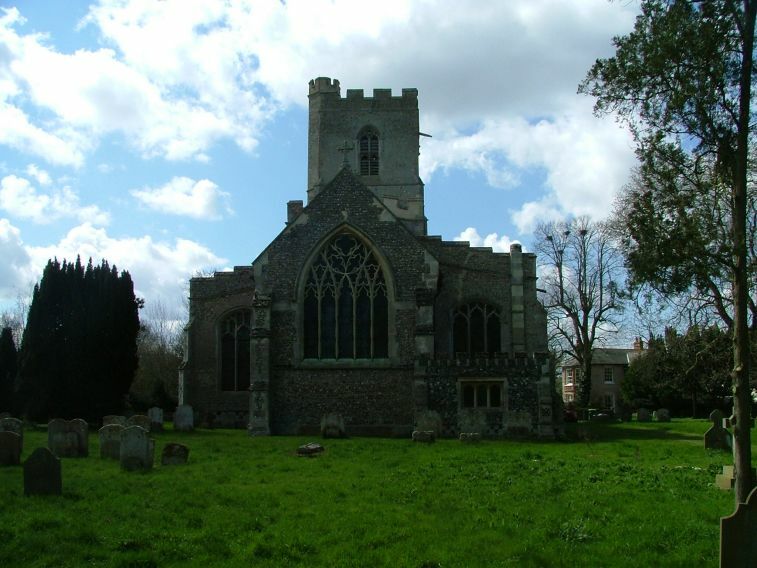 I had once come here on an Easter Sunday, at the end of a mopping-up operation of previously unvisited churches in the area between Hadleigh and Bury. All of them were open, all of them full of the scent of Easter lilies. 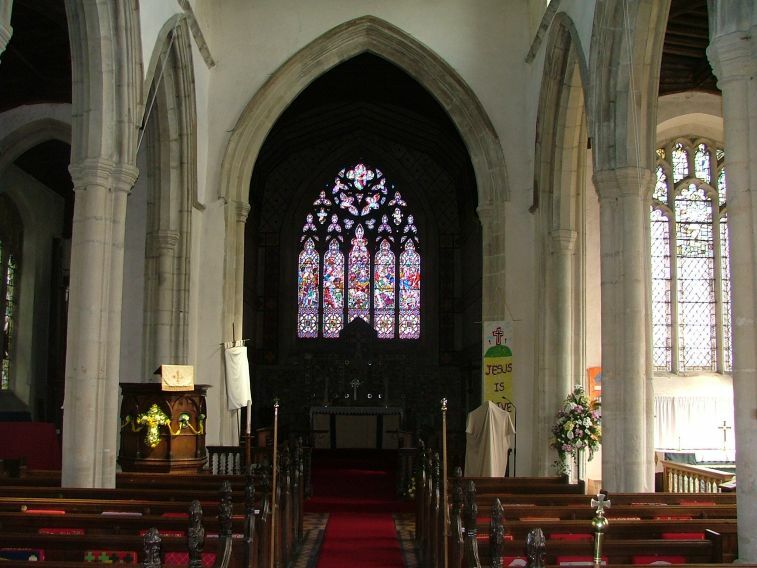 I met churchwardens and parishioners full of enthusiasm for their churches, full of enthusiasm for the glorious festival of Easter, eager to show me around. Except here. Here, the church was locked, with a padlock on the outside doors. This didn't dispose me particularly well to the place, as you can imagine, and I'm afraid I was rather grumpy about St Lawrence on the first entry on this site. 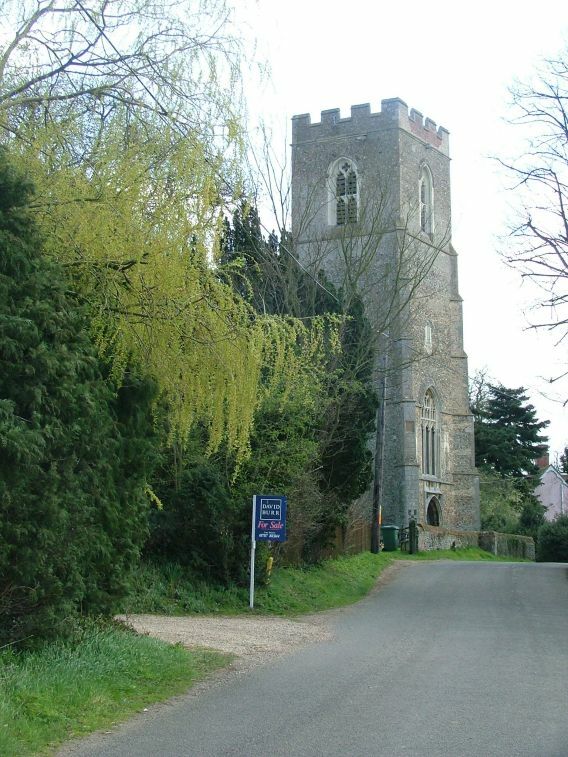 However, a patient Churchwarden, Chris Francis, contacted me, full of enthusiasm about visitors, and telling me that two signs had gone up on the main road to tell pilgrims and strangers when the church is open. 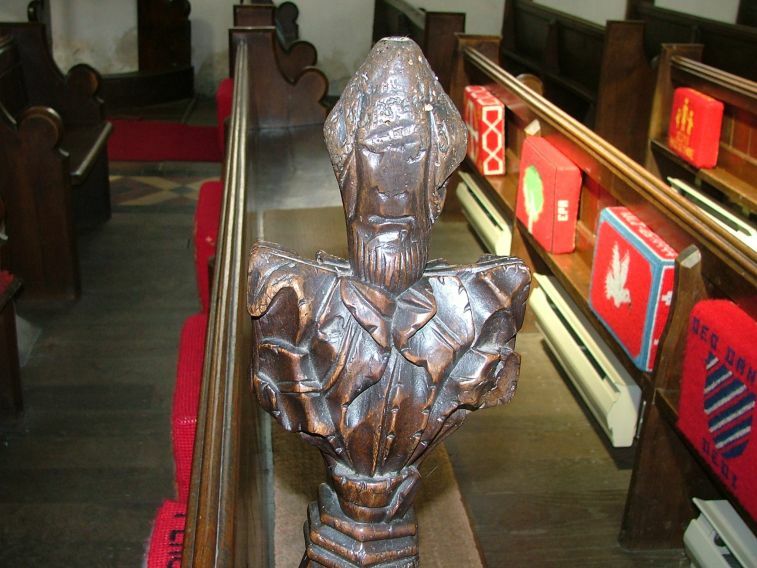 The parishioners were organising a watch-and-welcome stewardship rota, and even if the church was locked, it was possible to obtain a key. 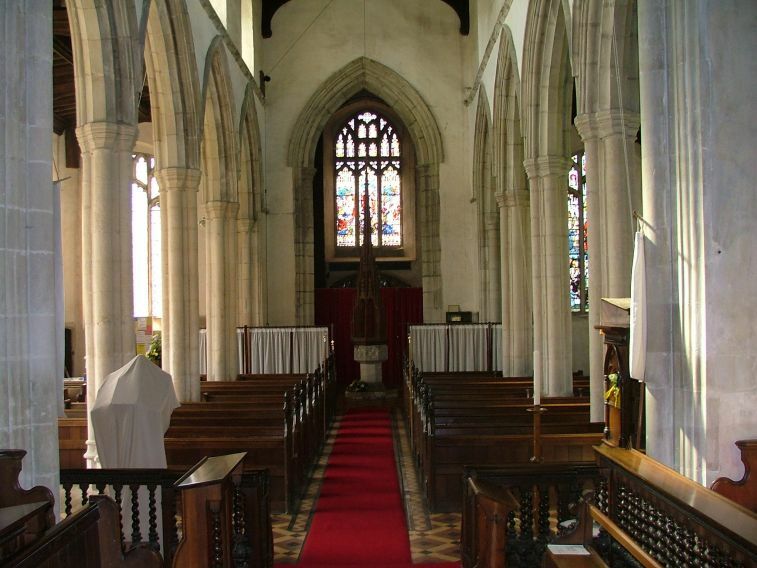 The parish had begun to go out of their way to make the church somewhere that, even outside of service times, people can experience the presence of God, for which it is to be warmly congratulated. And so it was that I came here in 2006, coincidentally again on Easter Sunday. I had cycled from Ipswich, trying out a new bike and stopping at some old favourites on the way. Unfortunately, I found this church locked again, but this time there was something new, a keyholder notice, and the key was available just across the road at Churchgates. I was descending to Sudbury and Sunday dinner after this church, so getting inside St Lawrence was a nice end to a lovely ride in the sunshine. The key in my pocket, I wandered around this impressive building. 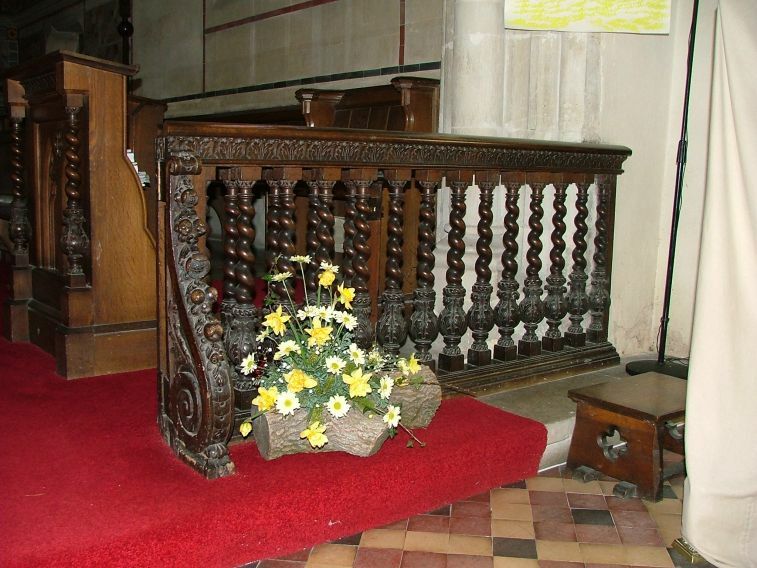 One of the most substantial roodloft staircases in Suffolk rises on the north side. Along the clerestory, a dedicatory inscription asks for prayers for the Boteliers, who paid for all of this, and two fine porches front the doors. 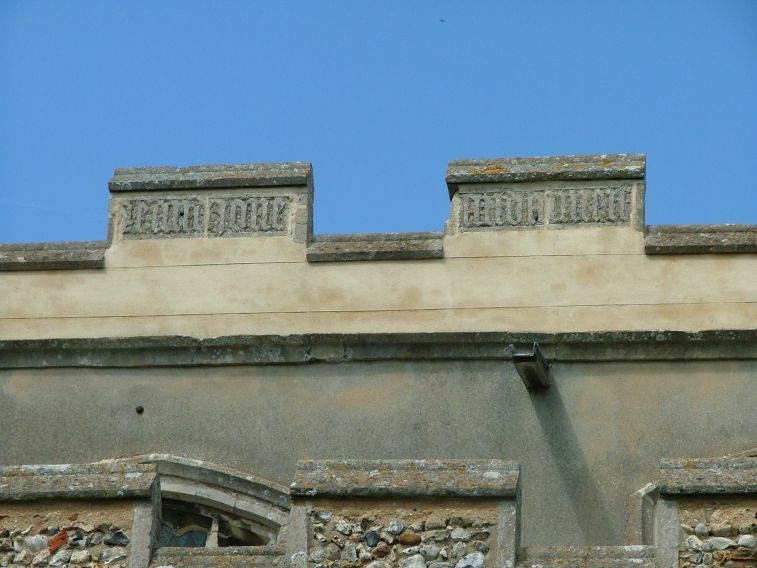 At the west end, a niche on the tower has been filled with a modern image of St Lawrence. Turning the key, I stepped for the first time into the interior of St Lawrence. As often at this time of the year, the temperature inside was several degrees lower than outside in the sunshine, so I wrapped my jacket around me. 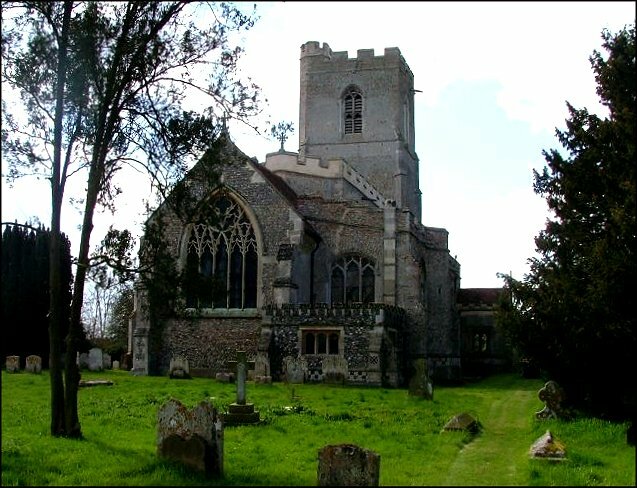 Unlike its near neighbour at Little Waldingfield, Great Waldingfield church has a fairly urban feel which comes from a considerable 19th century restoration, but this has given it a character all of its own. Many people who visit will have come to see the sanctuary, set with stones robbed from ancient ruins in Rome and Upper Egypt by two old ladies in the 19th century. This sounds interesting, but is actually also rather wonderful, and well worth getting the key for. 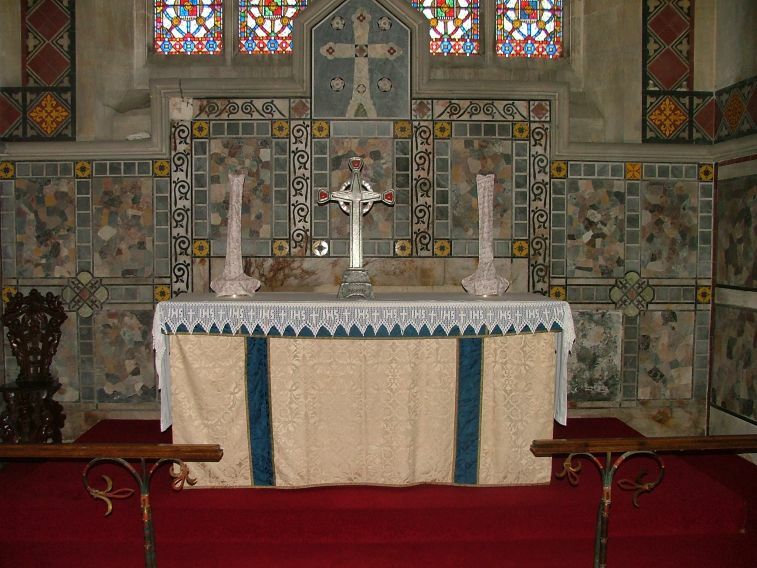 The entire chancel is decorated in a high Victorian manner, and the stones have been set and polished within panels in a Byzantine style. Neither Mortlock nor Cautley could find much say about the interior. 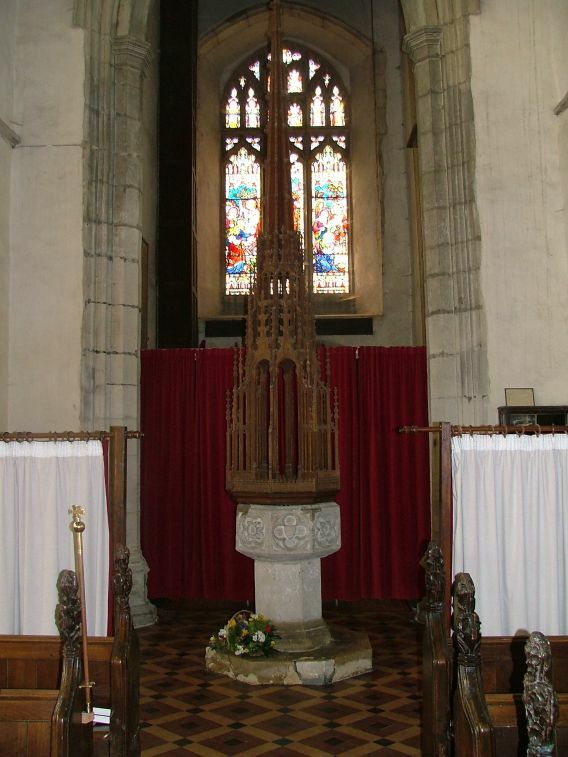 Butterfield built the chancel; Hakewill, an architect with rather less imagination, refurbished the nave. 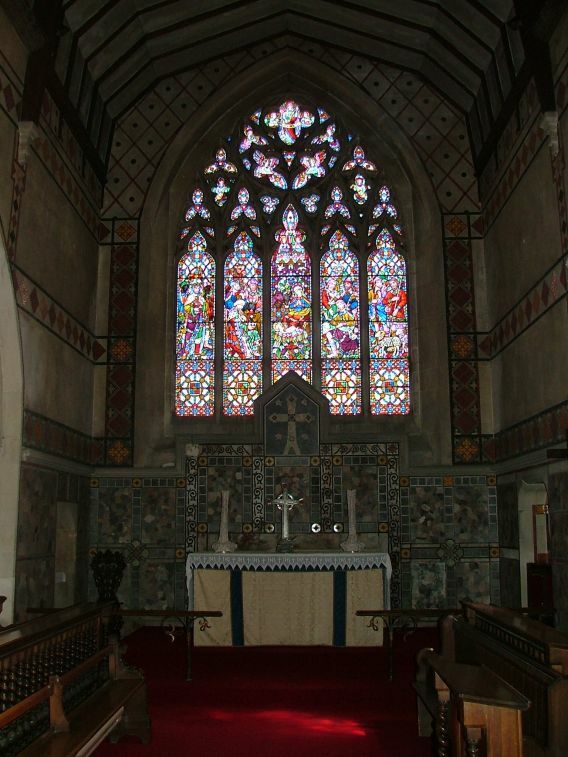 I have often wondered what happened to the original east window; Butterfield filled his rebuilt east end in the 1860s with a richly-coloured depiction of the Adoration of the Shepherds and the Magi by Gibbs, but White's directory of 1844 notes that the east window was richly decorated with coloured glass. Looking at Gibbs glass, it struck me as how unusual it was to see the Nativity as the centrepoint of a church's focus, given that in the last fifty years or so Christmas has become the last significant thing about Christianity for so many people. The glass at the west end is also unusual. A window in memory of Emily Baily depicts the gathering of the nations to hear the Word, but I liked best the Old Testament scenes, particularly an angel staying the hand of Abraham as he is about to sacrifice Isaac, his only son. There's also a good Baptism of Christ, paired with the Presentation in the Temple. Fragments of medieval glass cluster in the east window of the south aisle. 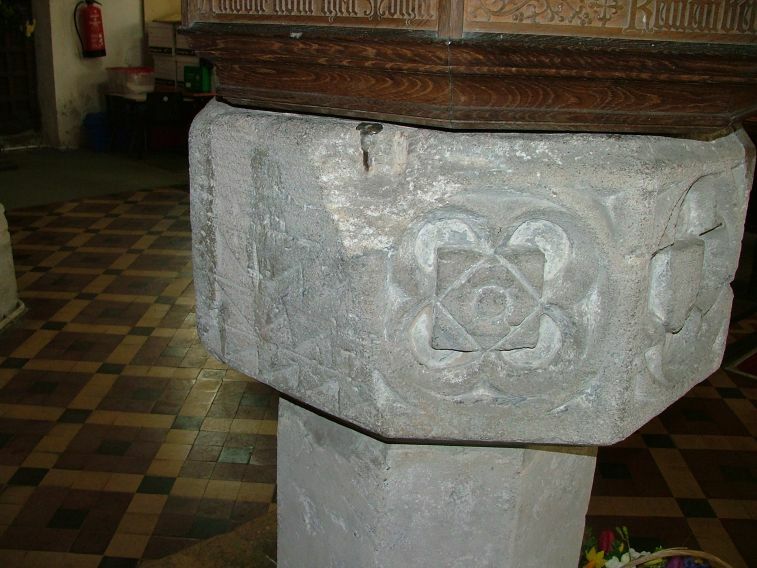 The font is crudely carved, and topped with one of those towering covers which were fashionable copies of late Perpendicular in the early years of the 20th century. 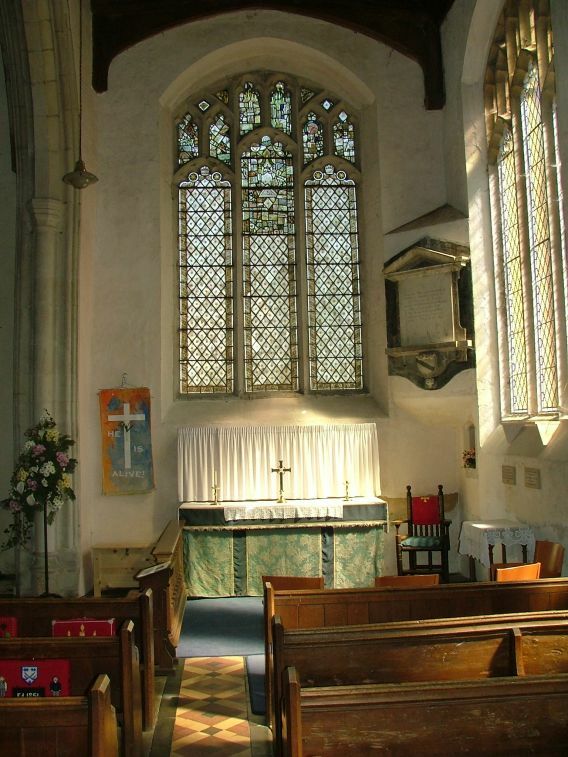 Also of note is the heavy 18th century screen and chancel furnishings, which I believe came from a church in the City of London, which contribute as much as anything to the urban feel. 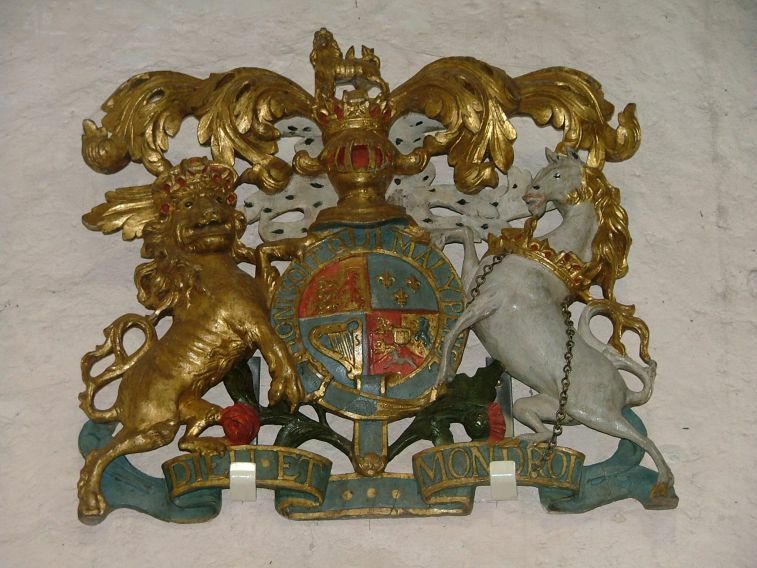 From underneath a protective sheet, a lion at the foot of the lectern peeped out at it all. 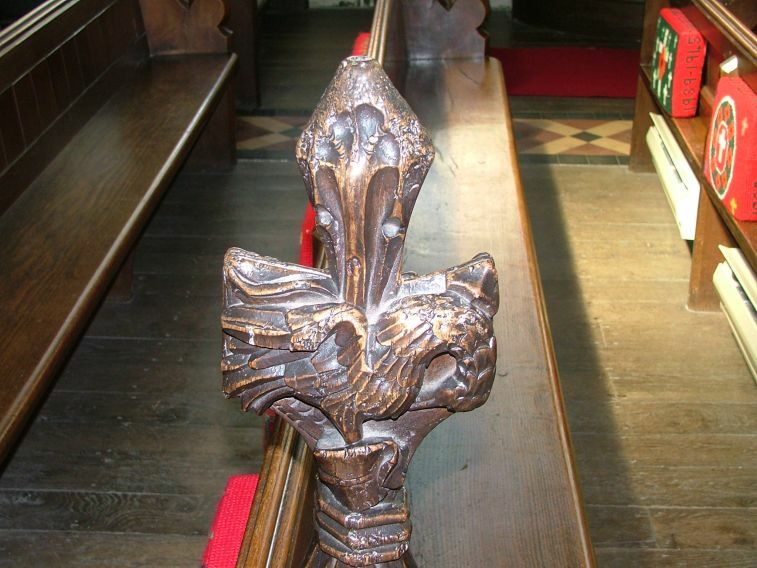 There is some older woodwork as well; a pelican in its piety pierces its own breast on a poppyhead. One of the Vicars here in the Elizabethan era, who most certainly would not have approved of such sacramental imagery, was John Hopkins. He's most famous for co-producing the first metrical version of the psalms, but should also be remembered as one of the collaborators on the vile Foxe's Book of Martyrs, the virulently anti-Catholic textbook installed in every English church by Elizabeth to ensure that people didn't feel too wistful for their pre-Reformation heritage. Hopkins was responsible for some of the gruesome and dull-headedly patriotic verses, and in writing them he also bears a responsibility for the consequent two hundred years of hatred and murder. Even today, the book is used by extreme protestants as evidence of the evils of Catholicism.